The Xbox 360 parental controls allow you to choose which games can be played by your child, as well as which movies and TV shows can be watched. You can set a daily or weekly limit for your child as well, which is great and something other consoles don’t do. 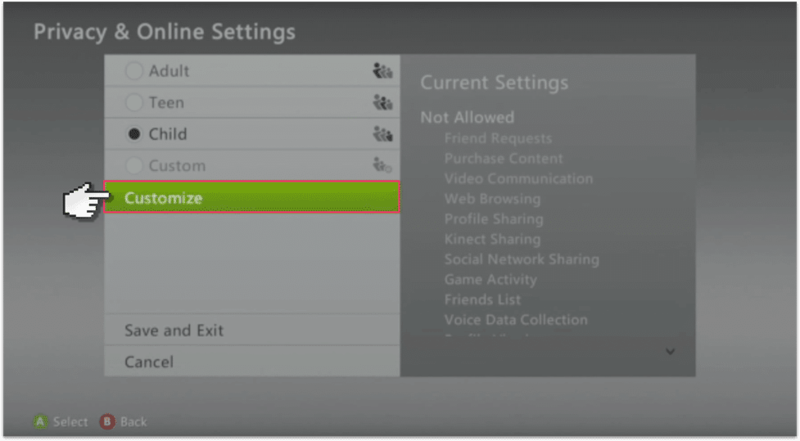 Turn on the Xbox 360 and in the main menu select Settings and then Family. If you have a child account already set up then it will show here, so scroll until you get to Content Controls. Turn the settings On, and you’ll see some parental controls that are already set up for you. You can now go through the controls and change them to how you’d like them set up. Setting up the Family Timer is a good first step to prevent your child from using the Xbox for too long. Then select Change Pass Code and create a passcode and security question to protect these settings from your child. Go back to the Family Settings screen and select the child’s user account. In the menu select Privacy & Online Settings and then Change Settings. Select Customise. Then you’ll be able to customise the privacy settings for your child. Save the settings to finish, but watch out these settings can take up to 4 hours to apply.